Michael and Joanne Fritz live in a 2,900 sq. 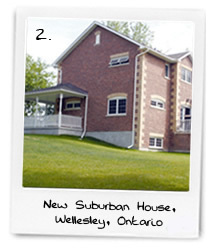 ft. house in southwestern Ontario. The house is one year old and sits on a two-acre lot. The Fritzes wanted a system that could efficiently heat their house and compete with the natural gas that was the best alternative. They were also concerned with the environmental impact of the system. A Geothermal Specialist in the area designed and installed the geothermal system. First, their experts calculated the required load on the house, the cost of the installation, and the expected savings very precisely using the modeling program GeoDesigner. A horizontal loop measuring 3,000 ft. in length was buried in the backyard at a depth of six feet. A single Forced Air unit was installed in the basement to provide space heating, cooling, and hot water. Ductwork was also installed throughout the house. The full installation of the geothermal system was completed in about one week. The Fritzes are enjoying great annual savings over the high-efficiency natural gas system that was the best alternative (they also have a reduced electrical bill from savings on air conditioning and hot water). The extra cost of installing the geothermal system will be quickly repaid. The geothermal system is also, of course, entirely non-polluting. The Fritzes paid $1,000 to bring the gas line in from the road for the stove and barbecue, but opted for geothermal to meet their space conditioning needs. The Fritzes are thrilled with the great comfort level geothermal energy provides. Even on the coldest days of last winter, the house was maintained at an even 70 Deg F during the day and 65 at night, as desired. The Fritzes were amazed at the lack of cold spots anywhere in the house. The Fritzes are very pleased with their geothermal system. They have highly recommended geothermal to several people in the Guelph/Ariss area. Their experience demonstrates the applicability of the geothermal solution in a suburban environment.